Hi everyone! My name is Emily Mazur, and I’m one of the new Sea Grant Malouf Scholars. I am currently in my second year of my Master’s program in Marine Resource Management at OSU. I am very excited to continue building my relationship with Oregon Sea Grant and Oregon’s coastal communities! Before I dive in to my graduate and Malouf work, I want to introduce myself a little further. Growing up in California’s Sacramento Valley, my experience with the ocean was very different from people’s perception of warm LA waters and surfing. 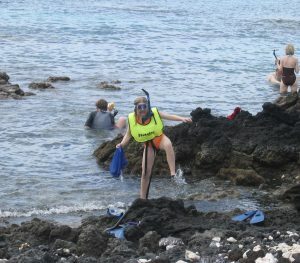 Instead, I grew up exploring the tide pools of Northern California, unaware of the diverse life under the sea until we took a family vacation to Hawaii and I snorkeled a tropical reef. It was on that vacation that I fell in love with the ocean and was determined to learn how I could protect it. I attended college at the University of Miami (I wanted to be in as sunny of a climate as possible! ), where I studied marine biology with a marine policy minor. As an undergrad, I had a truly transformative study abroad experience in the Galapagos Island, Ecuador. Prior to living abroad, I had only been exposed to the science and tourism aspects of the ocean. 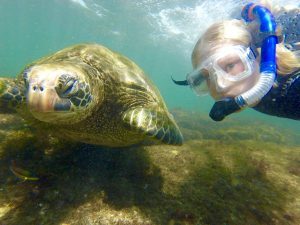 While in the Galapagos, I began to understand and appreciate the essential roles that the ocean plays in all aspects of community life. From that experience onward, I knew I wanted to work with communities as a representative of their voice in science and management of coastal resources. This is how I ended up here, back on the Best Coast, working with Sea Grant to get an interdisciplinary degree. My research focuses on how to communicate science to our coastal natural resource managers. I want you to think about your favorite coastal resource. Is it shellfish that you harvest at the beach? Fresh fish that you buy from a local fish market? Maybe it’s simply just enjoying our coastline – the rocky intertidal tide pools or state beaches. Now I want you to think of the groups that may manage these resources – fisheries managers, the coastal program, water managers. When these managers make decisions about our resources, we trust that they have access to scientific information to make the best decisions possible. However, it has been difficult for scientists to communicate the necessary scientific information required for resource managers to make the best decisions. This is where my research comes in. I am working with a webinar series called NOAA (National Oceanic and Atmospheric Administration) West Watch that takes information about environmental and coastal conditions (and the impacts of abnormal phenomena) on the West Coast and makes it directly available to resource managers. We think that this webinar can be used as a mechanism for scientists and managers to communicate directly, co-creating knowledge in a less formal capacity than meetings and conferences. We see West Watch as a forum where our natural resource managers can get scientific information they need to make decisions, as well have our managers communicate Oregon’s informational needs to scientific experts. So what does my life look like as a researcher and Malouf Scholar? I spend a lot of time building relationships with our state’s natural resource managers through direct communication. This includes trying to figure out our manager’s informational needs to see if NOAA West Watch can be adapted to fit those needs. It is important to build trust, and experiencing a variety of science and management perspectives has made me more aware of how people perceive the environment. This term has given me opportunities to have face-to-face interactions with a variety of Oregon coastal stakeholders. 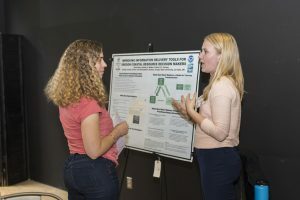 At Sea Grant Scholar’s Day in October, I saw the diverse student research that Oregon Sea Grant funds, and had thought-provoking conversations with students about my research. At Oregon’s State of the Coast conference, I presented my research and gained valuable insight from both our scientists and managers about the challenges we face with science communication. I would love to use the blog as a way to connect with those who are interested in Sea Grant and our coast. To encourage interactions and dialogue, I will be posing a question at the end of each blog post. For this post, I would like to hear from you about…. What are some abnormal things you’ve seen in the Oregon environment recently (e.g. temperature changes, water changes, animal changes, plant changes, fire, etc.)? « Genetics schmetics! What is the difference between all the different methods used in conservation genetics? What a great introduction, Emily! It was so nice to read about the journey to your research and how that has informed your work. I am very excited to learn more about your progress enhancing connections between science and management. In response to your question, something abnormal that I have noticed (and enjoyed) this fall in Oregon is this sunnier weather!